Based on the popular single person Scooter, but made for two or even three. Stable and fun, ideal for the family to mess about on the water together in. 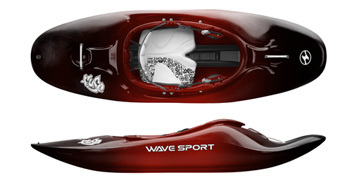 Now been re-branded as the Wavesport Gemini. Combining the best of moving water and touring technology, the all new Hydra from Wavesport takes touring to the next level. With a focus on features and performance, the Hydra cleverly combines quality materials and manufacturing processes with clever design to provide a touring boat that has plenty of play potential for those wanting to take their paddling to the next level. Back by popular demand the Wavesport Project X Same legendary hull design with revamped outfitting and all new colour options. Short and fast, the Mobius is Wavesport's latest freestyle playboat. It is a superb performer with plenty to offer seasoned competitors while also allowing less experienced freestylers to progress. With one of the most amazing hull designs in the river running market the, Wavesport Diesel could be one of the best choices for multi-day paddlers hoping to catch a wave every day. Not only will the Diesel run the rapids - it will also surf the hell out of the waves in them. The D-series is one of the best entry-level general purpose boats on the market today. This boat has the ability to run rapids and surf waves. It is the perfect boat for the aspiring white water legend. The latest design from Wavesport, featuring a fast hull with plenty of bow rocker and a wide tail for those hard landings and big water days! The Wavesport Ethos is a fantastic crossover boat which mixes river running abilities with flat-water touring capabilities. This boat is the perfect way into paddle sports for those who don't yet know which path to follow, and is also the perfect boat for a multi-day white water paddling trip. The Fuse's legendary hull design is loose and fast on waves with volume distribution that is not only comfy, but delivers crisp control whether you’re throwing cartwheels or simply running your favorite stretch of river. Smaller version of the Wavesport Fuse designed for the younger paddler. The big, bad, ultimate steep creek machine. Continuous rocker and a full displacement hull on the Wavesport Recon means: steep creek x paddler = kayaking rockstar! Available to order - Please contact us for price and availability. Tandem touring kayak. perfect for either short trips or multi-day expeditions.